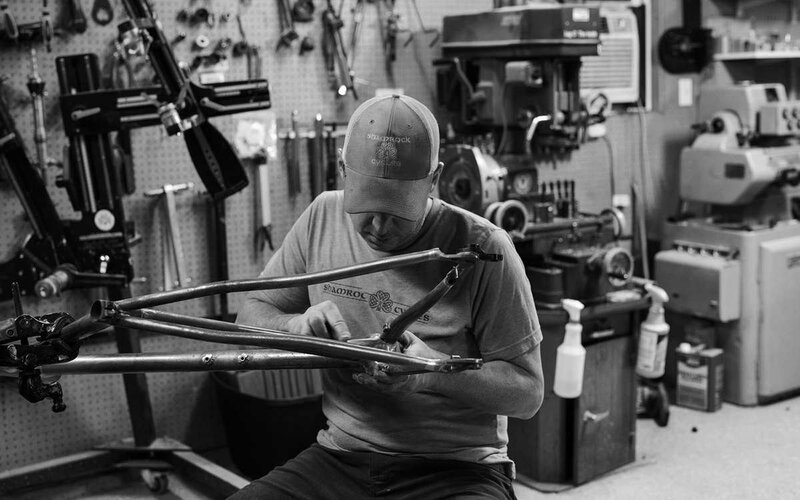 Founded in 2007, Shamrock Cycles is a boutique frame building shop nestled away in the free-spirited and artistic neighborhood of Broad Ripple on the north side of Indianapolis, IN. Here, amongst the laid back cafes, indie shops, music venues, local eateries and brewpubs is where I decided to open my frame building shop. There's a vibe about this neighborhood, an appreciation for craftsmanship and the genuine that suit both me and the Shamrock brand perfectly. More than ten years on, my passion for creating things continues to push me and my work to new places. The shop, while chaotic at first glance, is meticulously set up and provokes a sense of curiosity. There's always a build in progress, always someone stopping in to see what's going on, and always the sound of jazz in the background being periodically drowned out by the lathe or some other piece of machinery. You're also highly likely to find one or two partially put together vintage Ducati motorbikes and a piece of furniture in progress; two of my other passions when I'm done working on a bike for the day. Shamrock's approach to building a custom bike is a collaborative one. Even after ten years, I continue to insist on building one frame at a time; choosing to focus on the customer's experience instead of how many frames can be built in a month. With the exception of the line-up of Celtic Cross' used by the Shamrock Cycles Race Team, no two Shamrock frames are alike. Each frame features custom geometry, a purposeful selection of add-ons, custom paint, and is a reflection of the rider who commissioned it.